Cho-Pat’s NEW Knitted Dynamic Knee Compression Sleeve is a comfortable, lightweight, knitted knee support that combines warmth, compression, and support to help reduce pain and discomfort of the knee and promote healing. Measure around the leg 5½" above the center of the knee. Sleeve is anatomically contoured for maximum fit, comfort, and effectiveness. 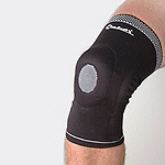 Uses a four-way stretch material over the kneecap to lessen inward pressure to the kneecap. Have incorporated an exclusive silicone padded insert that fits around the kneecap to help prevent drifting of the kneecap which can reduce wear to the undersurface of the kneecap. Flexible stainless steel stays inserted at the medial and lateral aspects of the sleeve keep it from rolling down. A special knitting process at the rear of the sleeve prevents bunching and pinching at the back of the knee. The breathable, knitted material facilitates the movement of moisture away from the skin. Applies uniform dynamics to the joint. Conforms to the configuration of the leg. Stays keep sleeve from rolling or bunching. Comfortable, lightweight, breathable knit material. Available in six sizes for more specific results.